Being a data junky I’ve enjoyed watching the stats for this Web site over the past couple years. I’m actually just about to hit 150,000 unique visitors which I suppose is a good enough milestone as any to reveal some statistics. Not so much as an exercise in egotism, but as a casual examination of Second Life’s popularity filtered through this site over the past ten months. I’ve had this site for over 2 years now, and prior to 2007, visits were few but steady. But as we all know, SL exploded this year with meteoric hype. I reference two pieces as a preface to this one: Hobson’s The Second Life Hype Cycle which talks about the Gartner hype cycle and Pixeleen Mistral’s article Second Life’s Slide vs. Everyone Else over at the venerable SL Herald in which she compares Alexa data from Second Life to some other virtual worlds. Alexa rankings are always a challenge because they rely on users having the Alexa toolbar installed, and it’s not clear who those users are. Of course this site’s Alexa ranking is a paltry 576,134 so I can’t compare it to my actual traffic statistics. If you’ve been following SL’s rise over the last year, the trend shouldn’t be surprising. Examining both the keywords used to find this site, referrering sites, and the emails I receive, people visiting this site are without a doubt new SL users. The ones that stay longer are usually new SL designers. After a certain point those users don’t return to my site (this journal generates very minimal traffic) because I don’t have anything else to offer them. 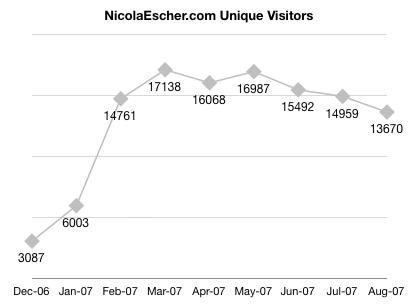 It’s my opinion that NicolaEscher.com traffic is a fair indicator of recently converted Second Life users—people who’ve experienced SL and need more help. One interesting thing to note, and something I unfortunately can’t quite get the break down for from Google Analytics (which might be my own ignorance) is that there was a relatively sizeable wave of PR which started in the US and quickly spread across the rest of the World. Whilst watching the numbers in May and June I saw a big drop-off in US/UK visitors and a huge surge in visitors from Germany. Recently there’s a been a surge in Brasilian and Dutch users. As you can see more Germans have visited (and are visiting) NicolaEscher.com than US and UK combined in the last 10 months. (Note that all my tutorials exist in both German and English language versions.) The thing I’d like to be able to do is view the US visitors vs. the rest of the World as I think we’d see a steeper decline in the US numbers. The news here of course is that outside the US, SL is probably still in the Peak of Inflated Expectations. There’s no question in my mind that SL in the US has slipped into the Trough of Disillusionment. I think the hard data is there to back it up, and I would wager there’s plenty of anecdotal evidence as well. The PR machine has certainly quieted down a bit and we’ve even seen a backlash in recent months. It will be interesting to see what happens in the 6 months. Not only are a whole slew of new MMOs being released, but potentialy SL competitors like MetaPlace, VastPark, Lego Universe are launching with others maturing like HiPiHi, Kaneva, and Multiverse. And I wouldn’t discount Makena either.